But unlike the previous two nights, the Salem-Keizer Volcanoes cast a bit more doubt on the outcome – though the ultimate result remained the same. 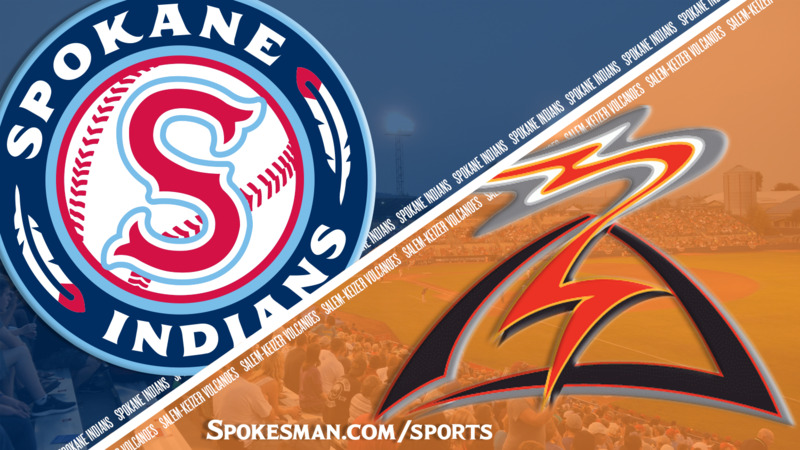 After taking another early lead, the Indians withstood the Volcanoes’ midinning push and got their third win in a row, 8-5 on Saturday at Avista Stadium. They remained one game back of Vancouver in the North Division second-half standings with eight games remaining. The core of the Indians’ lineup continued its surge: Curtis Terry went 1 for 4 with two runs batted in, extending his Northwest League lead to 55. Diosbel Arias boosted his league-best average to .372 with a 3-for-5 night, and Tanner Gardner hit his second home run of the series, going 3 for 4 with three RBIs. Gardner has eight hits and 13 RBIs in the first three games of this series. His latest big hit came at a crucial spot. With the Indians (17-13) clinging to a 6-5 lead in the sixth, Gardner turned on an inside fastball and slugged it over the left-field fence, scoring Arias. That backed a solid outing from Jake Latz (5-2, 4.27 ERA), who has wins in three of his last five starts. Emmanuel Clase put two men on in the ninth but got three outs for his 10th save. Through the early innings, though, it didn’t seem like Holmberg would need to turn to his closer. With Volcanoes starting pitcher Jake Wong (0-2, 2.59) gone by design – he has 10 previous starts but has not pitched past the third inning – the Indians broke open the game in the fourth. Without hitting a ball into the outfield, they scored twice off reliever Alex DuBord, whose final pitch struck Terry in the back to bring in the third run of the game. The bases still loaded, Arias lined a single to center, scoring J.P. Martinez and Jax Biggers to make it 5-0. Gardner followed with a dart up the middle to score Terry. For the third night in a row the Indians had a lead of at least six runs after four innings, doing more damage to the Volcanoes’ league-worst ERA. But unlike the previous two nights, the Volcanoes (13-17) answered. Wander Franco cleared the bases with a two-out double in the fifth, halving Spokane’s lead to 6-3. An inning later, Latz got into another jam, though not entirely of his own doing. Hasuan Viera dropped a routine popup at first, and two batters later Nico Giarratano singled to left. That was it for the Indians’ starter, who pitched into the sixth for the fifth consecutive game. Kyle Keith entered in relief. He struck out Kyle McPherson, the NWL leader in hits, for the second out, but he allowed hits to the next two batters. That scored the two inherited runners and cut the Indians’ lead to 6-5. Keith struck out Villar to end the threat and preserve the edge. But Gardner’s big hit restored the Indians cushion. Starling Joseph, who entered the game in a 4-for-33 slump, struck out three times. That gave him 79 on the year, the most in the NWL. … Latz took a comebacker off his right leg in the first inning, got to the ball but wasn’t able to make the throw. After a couple of minutes, he stood up, tossed four warm-up pitches and was able to remain in the game. … Volcanoes manager Hector Borg got a bit theatrical in the top of the seventh when Aaron Bond grounded into a double play but never left the batter’s box. Borg argued – for about 10 seconds, about 4 inches from umpire Ray Patchen’s face, that the ball fouled off Bond’s leg, which TV replays showed to be true. Patchen ejected him. Borg proceeded to give home plate a fresh blanket of dirt before making his way back to the dugout. Published: Aug. 25, 2018, 10:50 p.m. Updated: Aug. 25, 2018, 10:58 p.m.